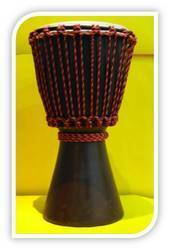 We are the manufacturer as well as exporter of Djembe. We are only looking queries from Foreign Region. 12" Wooden Djembe with shell made of Mango wood and high quality skin head. Black and rastafarian ropework. 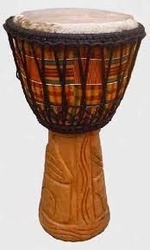 The djembe originated in West Africa, and is an integral part of the region's musical tradition and culture. The djembe is now popular all over the world. Djembes are commonly about 12" (30 cm) in diameter and 24" (60 cm) in height, varying a few inches. They can also be found at many smaller sizes, from 5" (13 cm) up to 18" (46 cm) in diameter.